In Vancouver, we waste so much food that could otherwise be put towards feeding people across the city, and in our own homes. To illustrate how far our food can go, Vancouver will be having a Feeding the 5000 event on May 27, 2015, with free lunch and info on food waste being dished up outside the Vancouver Art Gallery. Chef Don Guthro and the students from North Shore Culinary School will be gathering “rescued food” (food that will reach peak freshness before it can be sold to retailers or restaurants) to turn into a free lunch. Of course, since they won’t know what food will available that day, so the menu is going to be born of invention, and a surprise to attendees. 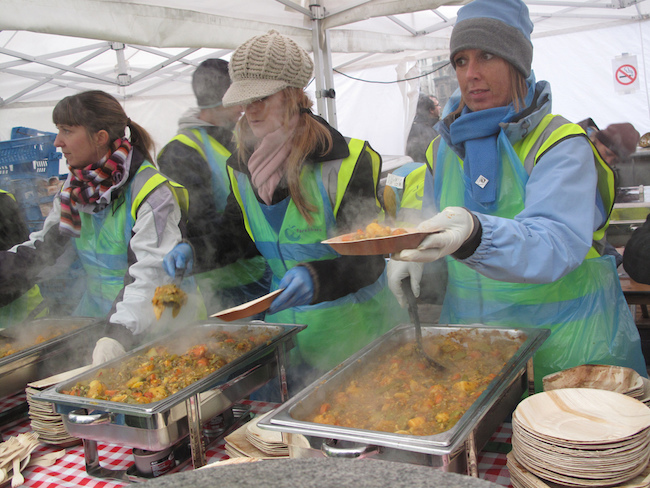 Feeding the 5000 is an event that began in London, England in 2009. This is the first year a Feeding the 5000 lunch is taking place in Canada, and it’s going to be Canada’s biggest “black box” lunch ever. The team responsible for bringing Feeding the 5000 to Vancouver includes the North Shore Culinary School, Elaine Cheng from Food Connections, the producers of the food waste documentary film Just Eat It, Metro Vancouver, and ordinary citizens who are passionate about the issue. The grassroots crew drew from feedback from past events in the UK and Oakland, California, in order to put together the wholly volunteer-run Vancouver Feeding the 5000. Jennifer Rustemeyer, one of the aforementioned producers of Just Eat It, says she came to be involved in raising awareness about food waste through the making of the film, when she and her partner lived exclusively on rescued food for 6 months. This is the same kind of food that will be the free lunch served up at the event. During [the] filming [of Just Eat It] we interviewed Tristram Stuart, Founder of Feeding the 5000 and author of Waste: Uncovering the Global Food Scandal. He introduced us to the concept of Feeding the 5000; I love that it is a such a hands-on way for people to experience the vast amount of quality food that is trashed every day. When we heard there was a group of people in Vancouver organizing the first ever event in Canada, we knew we had to be involved. While this lunch is truly free, it comes with a hearty side of important savvy regarding food waste. People who join us for a free lunch at the Vancouver Art Gallery on May 27 will learn about the high quality food that is going to waste in Metro Vancouver and what organizations like the Greater Vancouver Food Bank Society are doing to get that food to the people who need it. In fact, it turns out about half of what we throw out from our home kitchens should have been eaten, which is like throwing away $700 per year, say the event organizers. When: Wednesday, May 27, 2015 11:30 a.m. to 1:30 p.m.